An attic is usually the easiest part of your house to transform into a usable room, or specifically, the bedroom. This is because you don’t need to worry about the foundation or the setback. All you need to do is convert the empty room into a useful one. Whether you’re converting an attic to a bedroom for your kids or you simply want to make a change, keep reading for some helpful tips! Converting an attic can be really fun! 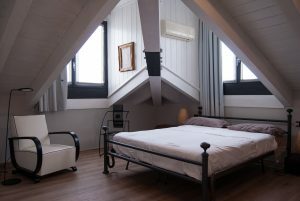 Keep in mind that converting an attic into a bedroom is a time-consuming task. However, doing this for your kids might be one of the best ways to help them cope with the relocation. You can include them in it and make it an exciting adventure. They will definitely enjoy the family project! Before you start remodeling and redecorating, it is of essential importance that you make a detailed plan. Before converting an attic to a bedroom, think about the layout of the room. Specifically, make sure you know the size of all the furniture you plan on using. Also, the location of everything is very important. Pay attention to where the outlets and the light switches are. This is important to know so that you know how to organize the furniture. Since attics are usually on the smaller side, you’ll need to measure every inch to be sure everything can fit. Because of this, research some clever tips for organizing a smaller space. In doing this, you will make an otherwise cramped room into a cozy and comfortable one. In short, the layout is literally just how you plan to organize the room. Think about the position of the bed and the desk. Also, the position of the wardrobe and vanity is important. Make sure you don’t place them in a spot which covers the electrical outlets. Also, if you’re thinking about adding extra walls, this is where you need to be very careful. Ideally, ask for experts help before deciding upon anything. In any case, be extra careful about the weight of all of your items. Since attics usually aren’t designed to hold a lot of heavy items, you might need to change your initial layout plan. A consultation with a professional would save you a lot of trouble later on. Moving services DFW are a great option. Asking a professional to evaluate your space will only be helpful! Usually, when converting an attic to a livable room, insulation tends to be a problem. In most cases, an inch of spray foam is installed underneath the roof and in the exterior walls. However, unless you live in an all year round warm climate, this probably won’t be enough. The best solution is to add blown-in cellulose in all areas which are hard to reach. Not only will this protect the new room from the weather but it will also help you save money. Namely, you won’t even feel a difference in your utility bills for air-conditioning and heating. Dallas-Fort Worth movers can also be of great assistance in this project. Professionals help is always a good option. Moreover, when converting an attic, think about installing R-13 and R-19 fiberglass batts on your exterior walls and ceiling. This will transform the space into a completely climate controlled room! Also, acoustic insulation is a good option. Since attics tend to be noisier because of their foundation, this will help you make it a little quieter. In most cases, attic floors are made up of wooden floorboards. Since these tend to get worn out over time, you might want to think about fixing them up. Again, a professional’s help would be amazing for this part. However, if you love a DIY project, be extra careful. You should really pay attention to stay safe and avoid injuries when moving and doing all of this work. Furthermore, you will need to check the underlayers and make sure that they are okay. Afterward comes the creative part and the decorating. Usually, the attics do not have an area for the bathroom. If you’re really determined to have one, you will need to make a lot of changes. In an example, you will have to add extra walls which will completely change the layout. Also, keep in mind that not all attics can support a bathroom. In more detail, some attics might not be connected to the pipes and drains. This would mean that you have to remodel your entire house. Therefore, having a bathroom in the attic isn’t always a possible option. 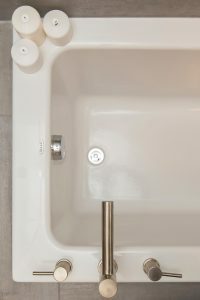 Installing a bathtub might not be possible! On the other hand, there are cases where a bathroom is already in the layout of the attic. If you are lucky enough for this to be your case, all you will have to worry about is making sure everything is functional! Check the drains, faucets, the toilet, and the shower or bath. Again, make sure your attic can support the weight, especially of a completely filled bath. After all of this is done, the only thing left is to decorate! Use only the best moving boxes. This will help you keep everything neat and practical. Since you’re converting an attic into a bedroom, you probably want to make it as ideal as possible. However, don’t forget to pay attention to details. 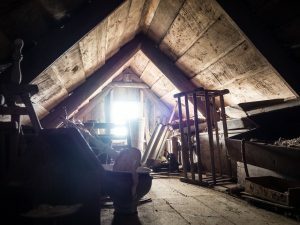 Most functional things connected to the entire house are located in the attic. Specifically, make sure you leave space for the ductwork for heating, vents, and the air-conditioning. A great solution would be to install a door specifically for easy access to the mechanical installations. In this way, none of these will be trapped behind the walls. Since you probably won’t use these doors often, but you want everything to be safe, think about Indow sleep panels. Even though they are for windows, they work perfectly for this. This is due to the nearly perfect airtight seal that they form. This will definitely keep all your mechanical and electrical installations safe. Ultimately, converting an attic to a bedroom might seem scary at first but is nevertheless a really fun adventure. As you can see, most of the work will already be done for you. Also, the rest won’t cost you too much of your budget to get in order. You will have a great, cozy, and bright room for you or your kids.